Leslie Bradley, Director of Blue Spruce Yoga, has taught yoga in the Iyengar tradition since 1985. She is a CIYT (Certified Iyengar Yoga Teacher) at the Sr I level and a recommending teacher in the certification process. She has been an assessor in the teacher certification process for over a decade. She is now serving as Certification Chair for the United States. She has made many trips to Pune, India to study directly with the Iyengars, most recently in 2015. Her 17th annual teacher training took place in 2016. Leslie was chosen as one of 70 women from 18 countries to attend the Women’s Intensive with Geeta Iyengar, learning much about the application of yoga to women’s specific needs. She studies with senior teachers in America on a regular basis. She has served as President, Vice President, and Secretary of IMIYA, the regional Iyengar association. Leslie started yoga for the joy of the physical postures. Over the years of practice and study, she has found yoga philosophy to be a source of great comfort, inspiration and wisdom. B.K.S. Iyengar is of an ancient and respected lineage in the yoga tradition, and Leslie is grateful to have all the wisdom of her teachers and their teachers to inform her practice and teaching. She is also grateful to have the opportunity to share what she can with her students. Craig Kurtz is an Intermediate Junior III certified teacher in the Iyengar Tradition and has practiced yoga for 30 years. He has studied with BKS and Geeta Iyengar, Manouso Manos, Ramanand Patel, Nancy Stechert, Swati and Rajiv Chanchani, Gabriella Guibilaro, Debra Ann Robinson. Craig is eternally grateful to BKS Iyengar and Geeta Iyengar for making yoga accessible to all, and for outlining a methodical and thorough system of teacher training. Denise Johnson is certified at the Intermediate level. She has been teaching Iyengar yoga since 1990. She has attended all national Iyengar Yoga conferences since 1990, and she studied in Pune, India, in 2001. Denise's special areas of emphasis include restorative yoga for cancer, chronic fatigue syndrome, and fibromyalgia. She was President of The Yoga Group, a non-profit organization providing free Yoga classes for people living with HIV/AIDS and cancer, from 1992 - 2007 and remains on the Board of Directors. Denise received her B.A. in Contemplative Psychology and Buddhist Studies from Naropa University in 2001. Sawyer Ward has studied yoga for over 40 years and is certified at the Intermediate level. She has studied with the Iyengars (four trips to Pune India, and all U.S. Conventions since 1990), Mary Dunn, Dean and Rebecca Lerner, Manouso Manos, George Purvis, Gloria Goldberg, the Chanchannis, and Devki Desai. 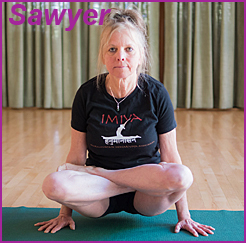 Sawyer is dedicated to the Iyengar system and to helping others reap the benefits of this most auspicious method. She finds great joy in the practice of Bhakti yoga, the yoga of devotion and in mantra yoga, chanting and singing with others. Diane Goldstein is certified at the Introductory level. She was introduced to yoga while studying social work in the 1970s. After graduation from law school, she moved to Colorado and began practicing Iyengar yoga with Leslie Bradley. She has used yoga to strengthen a weak back brought on by the demands of mothering three young children. Diane has deepened her knowledge of yoga through the Advanced Studies and Teacher Training Program taught by Nancy Crum Stechert and Leslie Bradley, as well as training with various senior teachers who visit locally. She enjoys helping students discover the strength and peace a yoga practice can bring. Kelly Moore has studied yoga for 15 years and is certified at the Introductory level. She has studied with the Iyengars in Pune India, Manouso Manos, Patricia Walden, Swati and Rajiv Chanchani, John Schumacher, Dean Learner, Gloria Goldberg, Elise Miller, Francois Raoult, Gabriella Gubillaro, Nancy Stechert.